Register for our upcoming session 4 to 14 March 2019. All of Copyrightlaws.com’s courses are aimed at empowering nonlawyers to deal with copyright and licensing issues. See our FAQs on how eTutorials work. We’ve provided an excerpt of our Legally Using Images eTutorial below to demonstrate its content. Click here for further information. This program allows flexible learning through self-paced eTutorials and offers 24/7 online discussions and live virtual sessions. The Legally Using Images eTutorial is one of five courses in our copyright certificate programs. You’ll receive a Certificate of Completion at the end of this eTutorial. Contact us if you have any questions about this course. Register for Legally Using Images eTutorial, 4 to 4 March 2019. I thought the email format was excellent. I was able to read through each lesson and quiz in about 30 minutes. Each lesson was densely packed with practical copyright information. I especially liked the links to Further Information. Having this information will help me better explain to our authors “their” need to procure permissions for images they use in manuscripts they submit to us. I got exactly what I expected from this course. The email format was great. I thought the in-depth analysis of Creative Commons licenses was the most valuable piece in the lessons. Would be an excellent primer for anyone coming into a copyright job. I really would have appreciated this course earlier in my career. Note that this is one small excerpt from this course. The e-lessons in this course comprise 58 printed pages, with 50 vetted and recommended resources on legally using images. In addition, eight of the 10 lessons in this course have a multiple choice quiz so you can test your knowledge. 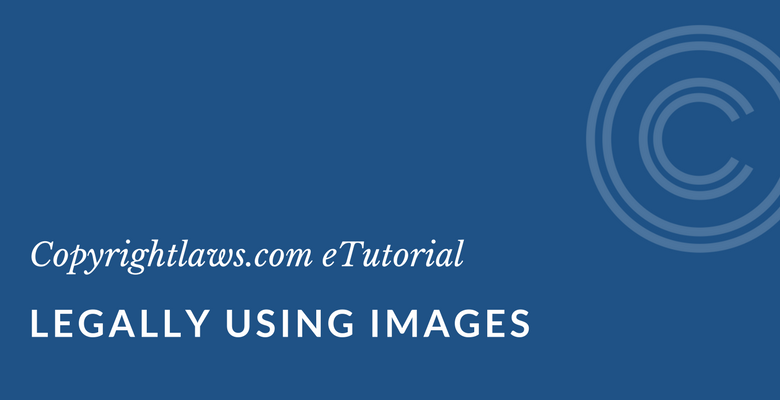 This lesson discusses situations where you generally don’t require permission to use an image, as well as 14 best practices for legally using images. Here are the first seven of those best practices. Assume that any image you find online or elsewhere is protected by copyright. Linking to an image is less risky, in terms of copyright law, than copying and pasting that image onto your site. Create your own photos when possible. Unless you are required to take photos as part of your work duties, you own the copyright in your own photos. You should obtain a model release from any persons appearing in your photographs, which is separate from a copyright issue. Generally, obtain a model release where a person or body part, such as an identifying tattoo, is recognizable. A Creative Commons license is just that: a license. Read the terms and conditions and see what is allowed or not. Stock photo agencies provide a license to use images in their repertoire, subject to terms and conditions (to which you tacitly have agreed). For example, iStockphoto has standard and extended licenses. Each license allows you to do specific things. Read the license summaries that the stock agencies provide. Just because you obtained permission once does not give you unlimited use of an image. Check the permission to see if it was one-time or multiple-use, over what period of time, and for what purposes. Only adapt, manipulate or morph images with the copyright holder’s permission. This course is available on demand for groups. Contact us for more information. for your circumstances, see our Copyright Leadership Certificate.